The 8th edition Guide to Everyday Economic Statistics is a handy resource for understanding common everyday economic statistics and their historical context. The authors examine how different series are constructed, how they can be interpreted, and how we may use them effectively. 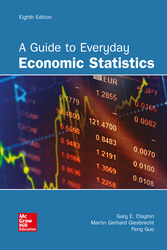 Students of all levels will find this guide easy to read and helpful in understanding how individual statistics relate to the economy as a whole.